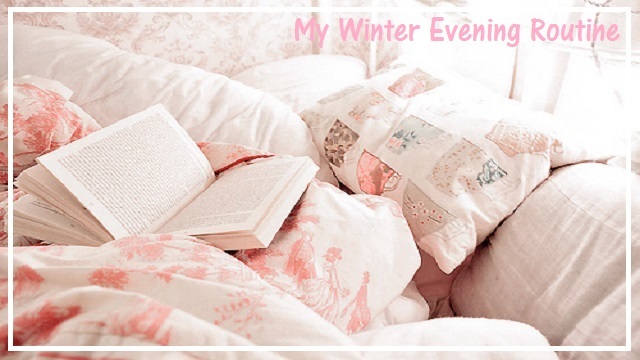 I've been asked a few times for me to do My Winter Evening Routine, and I know it's January but it still is winter time here in the UK so it does still count as winter for me here. If you want to know what I get up to on a typical winter evening then keep reading..
As a lot of you know I work from home as a full- time blogger so once I've finished work (which can usually be anywhere between five pm and seven pm), I'll make my way downstairs and have some food. Most of the time my husband Phil has made me some yummy tasty food for supper time and we will chill on the sofa and catch up on the day whilst munching. After we've ate food I'll call my Nan. My Nan is an amazing person in my life and I can honestly say I would be nothing or no-one without her, both her and my grandad mean the world to me. We talk on the phone at least twice a day and it's very rare that we don't see her and my grandad once a week. Once I've got off the phone with my Nan, I'll tie my hair up in a top-bun and get it out of my face so I can start my evening things I need to do. I'll pop some music on or put the television on and have a quick tidy up of the house; living room, dining room and kitchen so that tomorrow when I get up it's all nice and tidy. I hate waking up in a messy home. Then it's time to make myself a brew and whislt that's cooling down, I'll make myself lunch for the next day. I'm trying really hard to keep myself healthy right now, so I'll usually make myself a sliced chicken and salad sandwich on some wholemeal or brown bread for the next day. I'll also have some fruit to go with my lunch the next day too. After that I make my way upstairs and light some candles. Candles make me relax so much and right now I'm loving a candle which I bought from my local Primark store in Liverpool and its by "Master Nelis & Co" in the "Clementine and Honey" scent. It smells so good and was such a bargain for only £3! Next I like to take off any accessories I've had on that day and pick out my outfit for the next day. I like to know what I'm wearing for the next day so that I don't have the stress of the next morning of finding something to wear. So I get my clothes, underwear and socks, jewellery and my bag together of what I'm going to use the next day and get it all together. Once that little-stress is all done, I go into the bathroom and start running myself a bubble bath and whilst that is running I will go back into my makeup room and take off my makeup. I love face masks as so many of you already know so after a hard day at work I like to de-stress with a face mask to calm my skin down and myself down. I use a mask at least once or twice a week and I've noticed that it's really helped my skin and my achne so much! Whilst my face mask is on drying out I'll take my hair out of the top-bun and brush my hair through and get out all of my nots and tats that has built up in my hair, and then I tie it all back up out of the way for my bubble bath. I then go back into the bathroom and have my bubble bath. Whilst in the bath I'll obviously get washed but I'll also exfolate my skin, shave, take my face mask off, exfolate and cleanse my face and of course use a bath blaster or bath bomb in the bath to relax me. Note: If you haven't read my blog post about Bomb Cosmetics and everything they sent me then you should really do so by clicking here as it's one of my most popular posts. When I'm done in my bubble bath, I'll wrap my towel around me and go back into my makeup room and finish off night time facial routine. I'll use some serum, night cream, eye cream and moisturiser and then brush my hair through once again. I hate having my hair tangled as you can probably tell! Once my face is done, I'll blow my candle out and go into my bedroom. I'll pick out some pretty p'jarmers and change into them. I usually pick out some really comfortable p'jarmers and socks to chill out in for the rest of the night. Then, I'll head back into the bathroom again and brush my teeth and put on a lip scrub. I love the Lush lip scrubs and I'm still using my Santa one at the moment which I got from Lush Cosmetics. Mini night time pamper complete I'll go back downstairs to Phil and either watch a movie or television show and cuddle up with him on our sofa or if he's busy doing his guy things (example; xboxing or drawing) I'll climb into bed and read a book. At the point Phil will usually make me a yummy hot chocolate, I'll catch up on some comments on social media and then make sure my alarm is set and I'll head into bed for the night. I hope you all enjoyed reading this blog post, thank you if you were one of the lovely people who asked me to do it. If you want to request me to do a blog post or tag me in a blog post tag then please feel free to do so either by commenting below or by tweeting me. Have a wonderful day beautiful's!